* Olsen Brothers - "Fly on the Wings of Love"
* Nicole - "Ein bißchen Frieden"
* Helena Paparizou - "My Number One"
* Johnny Logan - "What's Another Year?" * Johnny Logan - "Hold Me Now"
* Dana International - "Diva"
* Domenico Modugno - "Nel blu dipinto di blu"
* France Gall - "Poupée de cire, poupée de son"
* Mocedades - "Eres tú"
* Celine Dion - "Ne partez pas sans moi"
* Sertab Erener - "Everyway That I Can"
* Cliff Richard - "Congratulations"
* Conchita Wurst - "Rise Like a Phoenix"
* Emmelie de Forest - "Only Teardrops"
* Lordi - "Hard Rock Hallelujah"
* Natasha St-Pier - "Je n'ai que mon âme"
* Johnny Logan - "Why Me?" * Anne-Marie David - "Tu te reconnaîtras"
* Bobbysocks! - "La det swinge"
* Dima Bilan - "Believe"
* Dima Bilan - "Never Let You Go"
* Rosa López - "La, la, la"
* Rosa López - "Vivo cantando"
* Rosa López - "Eres tú"
* Rosa López - "Europe's Living a Celebration"
* Herreys - "Diggi-Loo Diggi-Ley"
2018 โปรตุเกส ลิสบอน All Aboard! ทั้งหมด ณ บนเรือ! 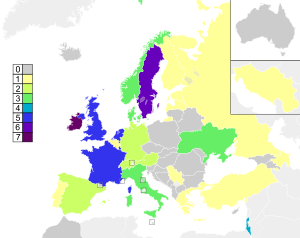 ↑ Finland wins Eurovision contestAljazeera.net (21 May 2006). เรียกดูเมื่อ 2007-05-08. ↑ Matthew Murray.Eurovision Song Contest - International Music Program. museum.tv. เรียกดูเมื่อ 2006-07-15. ↑ Philip Laven (July 2002).Webcasting and the Eurovision Song Contest.European Broadcasting Union. เรียกดูเมื่อ 2006-08-21. ↑ Eurovision song contest 2006 - live streamingOctoshape (8 June 2006). เรียกดูเมื่อ 2006-08-21. หน้านี้แก้ไขล่าสุดเมื่อวันที่ 10 มีนาคม 2562 เวลา 23:07 น.